It's been three months since Jake Archer rolled into town, accused Mia Connors of murder and stole her heart. She hasn't heard from him since. So when a man collapses at the fall Renaissance Faire, she's surprised to see the US marshal arrive on scene. And shocked when he points the finger at her—again. Mia would sooner be able to resurrect the poor fellow than poison him. Jake Archer's career has been rising fast, but it's about to come to a crashing halt. The Ren-Faire victim was in protective custody—Jake's custody—and they were painfully close to nabbing a major crime boss. If Jake doesn't solve the murder soon, he'll be fetching donuts instead of protecting his nation. A difficult enough task without the alluring Mia Connors in the way. Working with Jake to catch the killer might push Mia into crazy-cat-lady territory. But with a murderer on the loose—and Mia's reputation on the line—they'll have to work fast to find the killer before the killer finds them. 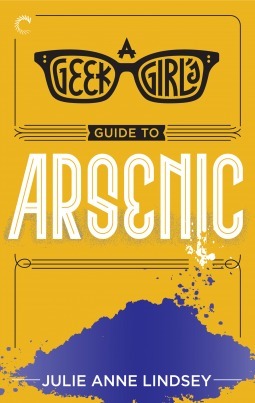 Julie Anne Lindsey returns with her geeky sleuth, Mia Connors, in A Geek Girl's Guide to Arsenic. The Renaissance Faire is in full swing but comes to a temporary halt when a man dies suddenly. The murder weapon, poison. As the last person to speak with the victim after giving him a drink of wassail and a sample of Guinivere's Golden Beauty, Mia is once again fingered as a suspect. Only this time her grandmother's company also takes a hit. In order to keep business coming in and save the company's reputation, Mia decides to situate herself into the investigation. Newly appointed US Marshal Jake Archer returns to town to solve the mystery of who killed the man in his custody and to keep Mia out of the line of fire. As the killer remains elusive Mia and Jake find themselves stepping into the new territory of romance. The connection between them is begging to be explored, but we only get a little taste in this installment. This is a wonderful follow-up to A Geek Girl's Guide to Murder. Lindsey reminds us that Mia is a normal human affected by traumatic experiences. She struggles to deal with her previous experience with a murderer, but family comes first. She's determined to clear their name and bring her world back to some semblance of normal. Still no better at the art of reading social cues, Mia is unclear where she stands with Jake. Of course, we readers know where this is headed but the happily ever after is still way off. Featuring quirky characters and die-hard cosplayers A Geek Girl's Guide to Arsenic is perfect for fans of Cathy Yardley's Fandom Hearts series!